Hazard 4 is renowned for its progressive tactical gear, incorporating functional, modular designs and top class, tough and branded fabrics. Now Military 1st online store in cooperation with Thomas Jacks Ltd is giving you a chance to win one of Hazard 4 unquestionable bestsellers: the Patrol Pack. 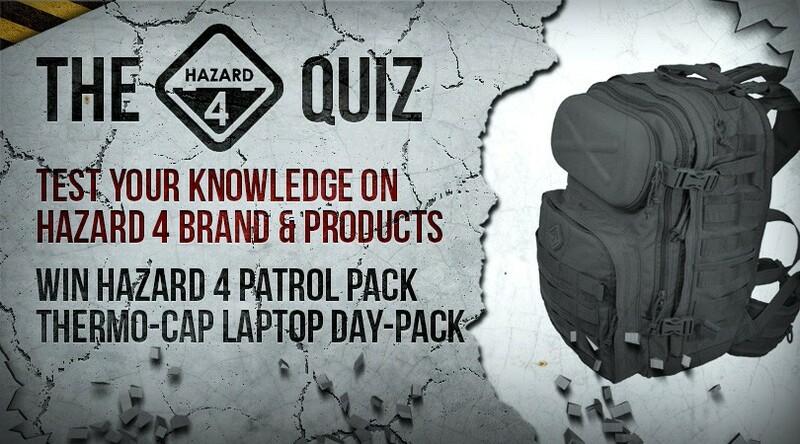 Test your knowledge on Hazard 4 brand and products and register now to take part! The Organiser: the Military 1st Hazard 4 Quiz is organised by MMG Trading Ltd, Unit 1, Fourth Avenue, Trafford Park, Manchester, M17 1DB, United Kingdom. MMG Trading Ltd (hereinafter referred to as the 'Company' or the 'Organiser') also provides the Prize founded by Thomas Jacks Limited (hereinafter referred as the 'Sponsor'). The aim of the Quiz is the promotion of the online store www.Military1st.co.uk and Hazard 4 brand. No cash or other prize substitution permitted except at Organizer's or Sponsor's discretion. The prize is nontransferable. How to enter: You can enter the Military 1st Hazard 4 Quiz through the Easypromos application on the "Hazard 4 Quiz" dedicated micro page (). •	Invite friends who can participate in the quiz (optional). By doing so the user can increase his/hers chances of winning by 'earning' extra entries in the final draw (check paragraph 6. Selection of winners). 2. Eligibility. You must be at least 18 years old to enter. Employees of the Organiser and the Sponsor, their children, parents, spouse, and members of their household are ineligible to participate. One (1) entry per person. Neither Organiser nor Sponsor is responsible for lost, deleted, incomplete, or late entries. No purchase necessary. A purchase does not enhance the chance of winning. 3. The Quiz will begin on the 3rd of August and will continue until the 31st of August. The Organiser reserves the right to, without prior notice and at any time, terminate the Quiz, in whole or in part, or modify the Quiz in any way, should any factor interfere with its proper conduct as contemplated by these Official Rules. The Organiser reserves the right in its sole discretion, to cancel the Quiz in its entirety, if it becomes technically corrupted or because of non-authorised human intervention. In a case of cancellation of the Quiz, the Company will post information regarding this across Military 1st social media channels and via email. 4. The effective date of entries. Entries will be effective on the day received. All entries become the exclusive property of MMG Trading Ltd and will not be acknowledged or returned. By entering this competition contestants agree for their emails to be used to send Military 1st newsletters with the latest news, discounts and special offers. 6. Selection of winners. One (1) winner will be determined by the final random drawing (held on the 1st of September) from all users who have answered all answers correctly. Scores are calculated by the Easypromos Quiz application based on the number of correct answers. Based on the number of invited friends who participated in the competition users will obtain extra entries for the drawing (e.g. 1 extra entry for each invited friend who took part). 7. Notification of winners. The winner announcement will take place on the 1st of September. The winner must agree to the use of his/hers name for the purpose of advertising or promotion without further compensation. The winner will be notified by email or/and through Military 1st social media channels. An email will be sent to the winner within one week after the drawing. All decisions are final and binding. Should the email be returned to the Organiser as invalid, two more attempts will be made via email. The winner must contact the Organiser within 15 calendar days from the date the notification is sent to claim their prize. Failure to contact the Organiser within that 15 day period will result in immediate disqualification of the selected entrant and a new winner will be selected. No exceptions will be made to this rule. The Organiser is not responsible for and shall not be liable for late, lost, misdirected, or unsuccessful efforts to notify winners. 8. Other conditions. Organiser, Sponsor, their advertising, promotion and fulfilment agencies and legal advisers are not responsible for and will not be liable for (I) late, lost, damaged, misdirected, incomplete, unintelligible or postage due entries; (II) telephone, electronic, hardware or software program, network, Internet or computer malfunctions, failures or difficulties of any kind; (III) failed, incomplete, garbled or delayed computer transmissions; (IV) any condition caused by events beyond the control of Organiser and Sponsor that may cause Quiz to be disrupted or corrupted; (V) any injuries losses or damages of any kind arising in connection with or as a result of the Quiz, or from participation in the Quiz; or (VI) any printing or typographical error in any material associated with the Quiz. 9. Indemnification. You agree to release and hold Organiser and Sponsor, their employees, advertising, promotion and fulfilment agencies, and legal advisers, harmless from any and all losses, damages, rights, claims and actions of any kind in connection with the Quiz, including without limitation, personal injury, death and property damage, and claims based on publicity rights, defamation or invasion of privacy. 10. This Quiz is in no way sponsored, endorsed or administered by, or associated with, Facebook, Instagram, Twitter. You understand that you are providing your information to MMG Trading Ltd, the Organiser, not to Facebook, Instagram or Twitter. In case of users that identify with their Facebook account, users will be required to authorise the basic permissions and email to the Facebook app associated to the promotion. These permissions will be used to (1) pre-fill the registration form, (2) obtain the user's profile picture, and (3) use their Facebook ID in order to check the number of times a user registers in the promotion. 11. These regulations come into force on the date of commencement of the competition. 12. The Organiser reserves the right to change these Terms and Conditions (also during the contest). 13. In all matters relating to the Quiz please contact the Organiser via email: info@military1st.co.uk.